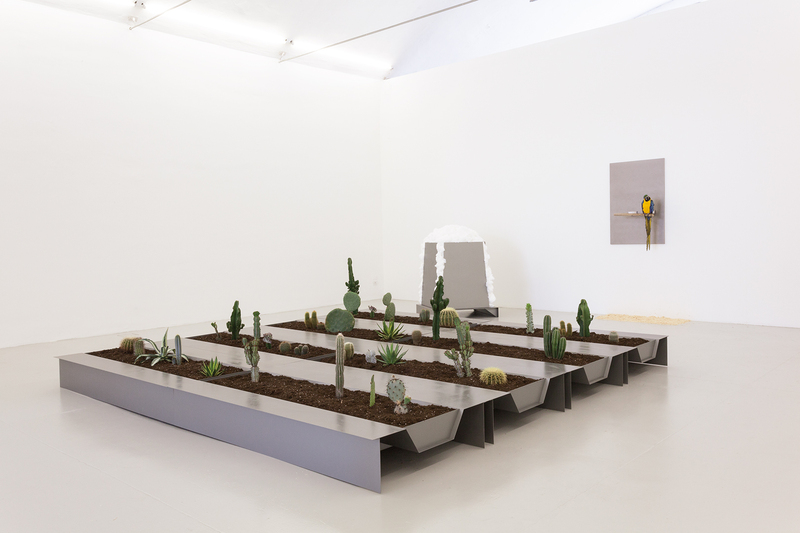 Campi (cactus fields), Pappagallo (parrot) and Cotoniera (cotton container) were conceived in 1967 for a solo show at the Galleria L’Attico in Rome (November–December). It was second time the gallerist Fabio Sargentini had invited his friend Jannis Kounellis to use L’Attico’s rooms that year.1 After painted pictures with numbers and signs, the 31-year-old artist created works that fell wholly outside the bounds of the familiar. He used coal, charred pieces of wood and burlap sacks – materials that suggest no relation to art but which are constituents of everyday working life and which operated, in the way that Kounellis placed them, as calls for an unbiased way of seeing. In the preceding exhibition with the title “Il Giardino; I Giuochi” (The garden, the games; April–May), Kounellis had already incorporated live birds into a work: little zebra finches twittering to each other and flanking a white picture of roses2. The genuine, authentic dimension that displays itself in the birds finds a variant in the catalogue to the 1983 Rimini exhibition of Campi, Pappagallo und Cotoniera, in which Kounellis replaced the usual text entry by a conversation conducted with children in front of the work3. Their spontaneous comments – even if they don’t make much sense, as Kounellis says4 – are an innocent expression of the openness and directness with which the artist is concerned. Kounellis’ works of these years are testaments to a new aesthetic. Campi, Pappagallo and Cotoniera are outstanding instances of an altered understanding of art that strips the artwork of its artificiality and viewers of their accustomed distance to the works on display. Kounellis here created a situation in which everything on the real plane becomes interlinked: the technical as well as the organic objects, their environment and the recipients. He has given the forms, colours and materials of nature a clear structure, placed them in wide steel containers and in front of a metal tableau and thereby established a counterpoint to their natural wildness. What appears to stand in contrast to the plants, bird, soil and cotton is at the same time the aesthetic link uniting the whole into one picture. Nature appears in ordered fashion – cultivated, but without loss of her diversity and original character. It is his ability to make life itself part of art, to endow his works with the same reality as their surroundings and yet to infuse them with the poetry of imagined images, that establishes the importance of Jannis Kounellis. As a complex spatial unity, they became one of the most frequently reproduced Kounellis works. 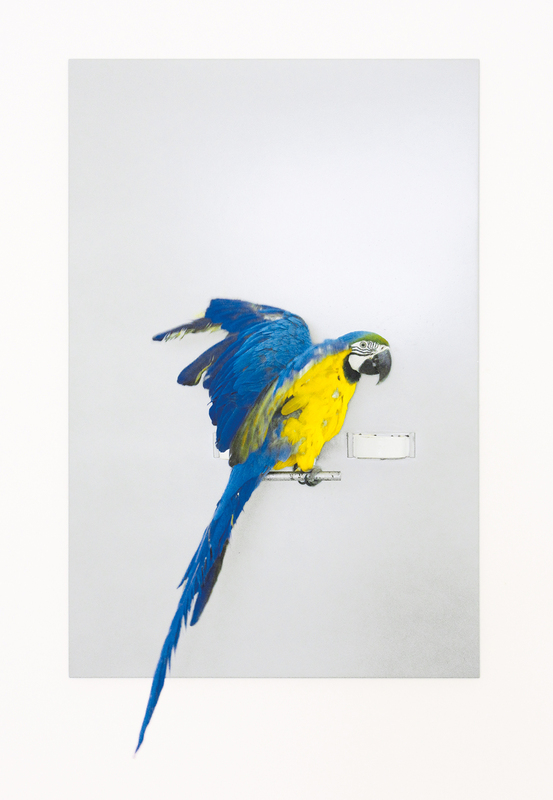 In particular the parrot in front of the steel sheet, as a new definition of the picture, became a symbol of a contemporary art rigorously expanded both in content and form – with a specific reference to its imaginative development in Italy. The role of the real-life bird was often misunderstood as a provocation at exhibitions and sparked corresponding protests. Initially, it was Kounellis’ own parrot, which preened its red and blue plumage on the bar in front of the grey panel and awaited the public each day with curiosity. Later it was mostly a blue-and-yellow macaw that was accustomed to being with people and rapidly developed a close relationship with its keepers. Kounellis has repeatedly presented his works in fresh contexts. He has used them as elements of a process that lives change as a principle. With each installation, the parts coalesce in a new way. Even if together they form a spatial whole, the effect is never the same twice. As everything exists in relation to everything else, to the surroundings, to light, space and neighbourhood, spectators are greeted each time by an unexpected picture. The atmosphere that it generates enfolds them each time afresh and increases their astonishment at the intensity of this all-incorporating art. The present text is an excerpt from the publication Jannis Kounellis: Senza titolo, 1967 (Campi, Pappagallo, Cotoniera) of our three-part publication series on works by Jannis Kounellis. All three publications comprise an extensive text by Christel Sauer and large-format illustrations of the artworks. Find more information or order in our bookshop. 1 Strictly speaking, for the third time: between his solo shows, from May to June 1967 Kounellis also participated in the group exhibition “Lo spazio degli elementi: fuoco, immagine, acqua, terra” (The Space of the Elements: Fire, Image, Water, Earth – with the ambiguous Italian abbreviation FIAT). 2 Senza titolo, 1967, fabric on canvas, dimensions of the canvas 250 x 320 cm; 24 birdcages each containing a live bird. 3 „Kounellis“, Rom: Galleria L’Attico, No. 86, December 1967. 4 Jannis Kounellis in the exhibition catalogue “Jannis Kounellis”, Rimini: Musei Comunali, 1983; p. 55.